Crosby and Ovechkin. Bird and Johnson. Harper and Trout. Two football players. * There’s nothing better than a sports rivalry where two contemporary players become elites at the exact same time. 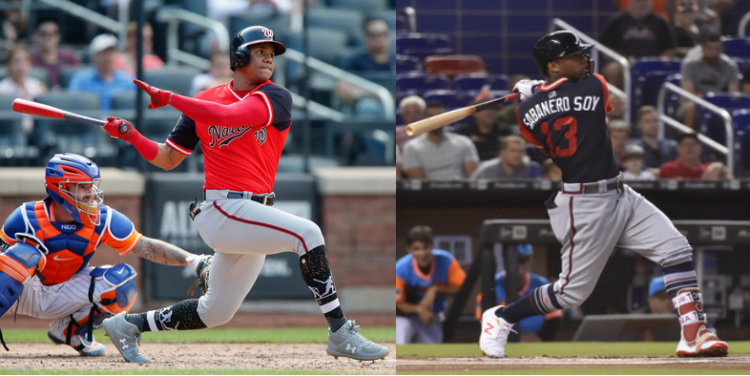 But unlike the rivals listed above–and what makes their rivalry even better–Juan Soto and Ronald Acuna are in the same division. We will witness 15+ games per year where the two young outfielders match up against each other. So that presents the natural question: Who is the better outfielder in fantasy? Soto has lived up to the promise that Bryce Harper promised but then didn’t deliver on until his early 20s: a championship-caliber teenage major league baseball player. Soto pretty much cruised through the minors in four months (spread over three years), putting up crazy strikeout and walk rates as he rose toward Washington. He embarrassed A-Ball pitchers at the beginning of 2018 by slugging .800 between the two levels. The Nationals didn’t wait to call up their next young star after just eight days at Double-A. 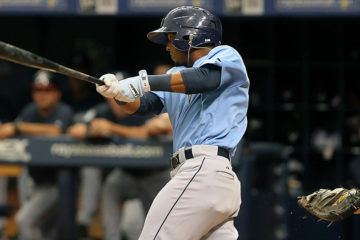 In the majors, he’s pretty much been himself: .291/.408/.510, 20% strikeout rate, 17% walk rate. His 160-game counting stats pace: 87 RBI, 29 HR, 112 runs, 4 SB. Those are pretty strong hitting statistics, but probably not a top-5 pick next year without improvement. Of course, Soto is probably going to get better. He’s 19! More importantly, he has essentially one season of professional baseball under his belt. I’m usually loath to project young successful players to get better (the Nomar Mazara Mistake), but Soto is an exception. He’ll get bigger and stronger as he matures, and is probably a good bet for at least ten more home runs. At the same time, if he’s not fast enough to steal bases at 19, he’s probably never going to do so. Acuna was the biggest name in the minor leagues to open the season, in part because he clearly was ready for the minor leagues. But unlike the Nationals did with Soto, the Braves slow-walked their teenage star in 2017, allowing him to hit an absurd .325/.379/.538, mostly in the high minors. Importantly, he also stole 46 bases (although he was caught 21 times). Acuna’s comparisons to a young Mike Trout were well deserved. In the majors, he’s done pretty much the same thing as the minors: .288/.357/.573, 27% strikeout rate, 8% walk rate. His 160-game counting stats pace: 91 RBI, 43 HR, 111 runs, 20 SB. Acuna’s already putting up clear top-5 pick numbers. But will he get better? I’m skeptical. Unlike Soto, Acuna has pretty average plate discipline numbers. His baserunning is improving from the minors, so he might add a few steals. 43 home runs always seemed like a high projection for Acuna in the minors, who was more of a 25-30 HR guy. Of course, he’s also incredibly young, so things could and probably will change. I think Juan Soto is a much better hitter than Ronald Acuna. His plate discipline since Rookie Ball has been consistently amazing; better than simply elite. I bet he has room to improve on the strikeout front in the major leagues. I wouldn’t be shocked if Juan Soto averages .320 with 40 home runs for a decade. However, power is cheap. Roughly 60 players are on a 25+ home run pace. Runs and RBIs are less plentiful these days, but Soto is probably going to underperform a little bit in an average Nationals lineup (short of a Victor Robles breakout). Soto is no doubt going to be a first round pick for some time, but I don’t think anyone is going to discuss taking him top-5 yet. Stolen bases are very hard to find. Trea Turner is the only player threatening 40 steals in 2018. Barely 15 players are threatening to break the 25-barrier. Stolen bases are incredibly valuable in fantasy, and Acuna (for now) has the promise of at least 20-25 steals, with an outside shot at 30+. I don’t think fantasy baseball has realized how valuable stolen bases are at the moment. I’m not sure I’d even take J.D. Martinez in the top half of the first round of a redraft league at the moment; give me someone with steals. Acuna might slow down eventually, but for now, he’s more of a Mookie Betts than J.D. Martinez, and Mookie is more valuable in fantasy. *Brady/Manning. Just file that away for your football reference next time you need a rivalry metaphor. You are just wrong about Acuna. But I will bookmark this article so I can come back in a year or two when Acuna wins MVP and say “told you so”. I watch his games, which aren’t televised as much as the overrated Nationals, and this kid is VERY special. His plate discipline is improving daily, and pitchers can’t intimidate him by throwing inside. I think with time, as he grows into his body, he will become a top 2 or 3 player next to Trout. 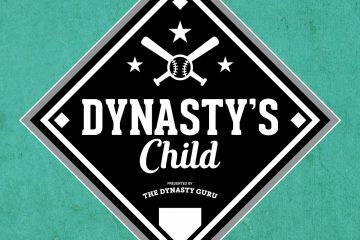 Fresh Take: Is Ramon Laureano "A Guy?"